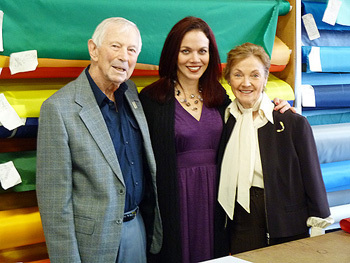 VANCOUVER, British Columbia (November 16, 2010) - Doreen Braverman, founder of The Flag Shop 35 years ago, announces today that she and husband, Jack, have sold their interest in the business to daughter, Susan Braverman. "It has been a long and rewarding journey from our first big order for The World Habitat Conference in 1976 to the 2010 Olympics", said Doreen, "but new printing processes and new technology require younger brains and lots of energy. Susan came back into the business 4 years ago and has demonstrated that she has the passion to take the business to even greater heights." The Flag Shop now operates under its corporate name, International Flag & Banner Inc. There are 12 Flag Shops across Canada, from Vancouver to Dartmouth. The Flag Shop is the proud owner of ECHOTEX® - a 100% recycled fabric, which is recommended to all customers who are environmentally conscious.